Everyone has been talking about the Golden State Warriors' move to Mission Bay, but did you know there is another sporting venue set to open? The name says it all: Stagecoach Green. NBC Bay Area's Colin Resch reports. 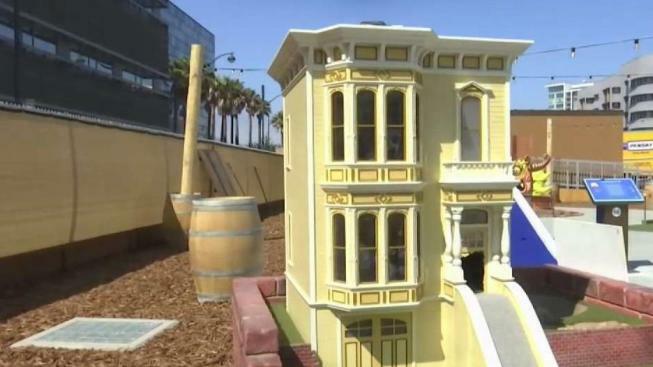 A new miniature golf venue is opening Friday in San Francisco's Mission Bay. Anyone who visits the sporting venue, Stagecoach Greens, will find an ode to the city's history -- from the Gold Rush to the tech boom and everything in between. It is a dream project for co-founders Jan and Esther Stearns. "It's about our love of San Francisco," Esther Stearns said. "The whole story is about San Francisco. Boom and bust." If the key to a successful business is location, then the Stearns have gold -- both figuratively and literally. Stagecoach Greens is situated between AT&T Park, the home of the San Francisco Giants to the north, and to the south where the soon-to-be Chase Center will house the Golden State Warriors. The Stearns are excited about being able to offer fans something to do while they wait, after and or before games. Stagecoach Greens will be open seven days a week from 11 a.m. to 9 p.m. For more information, or to book a tee time, visit StagecoachGreens.com.